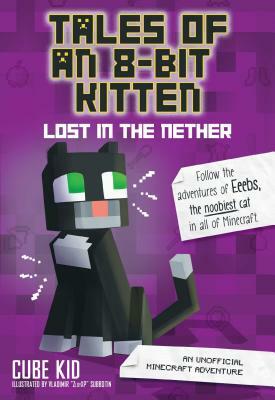 Best-selling author, Cube Kid, introduces a new series about a kitten named Eeebs who lives some incredible adventures in the world of Minecraft. Fans of Diary of an 8-Bit Warrior will find some of the emblematic characters from this series in the Nether. Eeebs isn't a very disciplined kitten. His mom warned him not to play in the forest, but he didn't listen. That's how he found himself in the Nether, a bizarre world inhabited by scary creatures. In the company of a ghast, almost cheerful witch, Eeebs develops supernatural powers. Will this be enough to fight against Endernova's army, the Enderman, who want to rule over the Overworld? In order to save his friends, Eeebs must become the champion of the Nether, as the prophecy of The Chosen One tells . . .